IF you watch Maamor Jantan at work, you will think that there is magic in his brush, for works of art seem to flow effortlessly out of it. 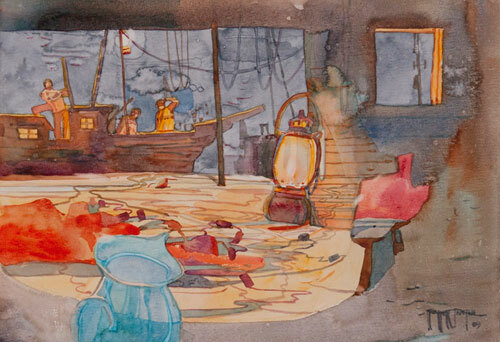 The watercolourist usually paints without lengthy preparatory sketches or reference materials. But when his first stroke hits paper, you will see his mastery of the medium. Whether it is a misty morning scene in Ubud, Bali, an evening panorama of a coastal village in Kelantan, or even a night scene of village folk cooking lemang on the eve of Raya, the artist paints with amazing speed. As colours and tones are loosely laid in a variety of shapes and lines, the viewer is mesmerised and led into dream-like undulating landscapes filled with beauty. Just when the viewer thinks that is all, surprises await. The profile of an earthen jar buried in the shadows; resting dragonflies camouflaged in thick foliage; or silhouette of crabs on rocks outlined by the setting sun are but some of the familiar things which will trigger fond memories of one's experiences. Maamor, the eighth in a family of 10 children, was born in Kulim, Kedah, in 1961. His family moved to Kuala Lumpur in the mid-1970s when his father, a policeman, was transferred to the city. 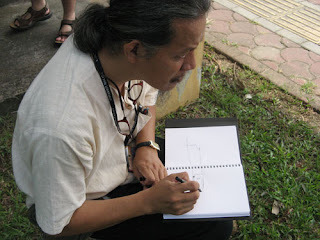 It was at Setapak High School that Mrs Chin Peng Weng, Maamor's art teacher, inspired his first strokes in art. "She always encouraged me regardless of what I drew or painted," said Maamor fondly. "She told me to follow my heart and paint with colours that give mood to my paintings." But the artist did not paint seriously until the early 1980s. After leaving school, he found a job at a framing shop. It not only brought him into contact with artists and collectors, but also reignited his interest in art. "Back then my paintings were not outstanding," Maamor said with a laugh. "They were nice but hardly professional-looking. My turning point came in 1984 when my friend Raja 'Man Banting' Harman gave me a box of Rembrandt watercolours. "When I painted with them, I saw the stark difference in my work. A prominent artist who saw my progress was so impressed that he said I had already become a professional." The artist was none other than Khalil Ibrahim, who became Maamor's close friend and mentor, and with whom he shared many moments in later years, travelling, sketching and painting. Without a formal art education, Maamor learned by watching nature and other artists at work. Through observation, he developed a keen eye for detail. "Recently, I was in the vicinity of Gunung Jerai. While watching the setting sun splash its colours across the landscape, I suddenly realised that those were the very colours I had so frequently used in my works. "I must have come across such moments a thousand times before without realising it and the colours must have somehow got etched in my mind subconsciously," he said. "Now, I know why I instinctively reach out for certain colours when I paint and how I am able to paint anything with such ease." While painting is easy for the artist, his life's journey has been a series of challenges. Born at a time when artistic pursuits were frowned upon, his family members frequently asked why he was not interested in getting a regular job although they never discouraged him. Maamor had two women to thank for his success. They stood by him as he worked in pursuit of his dream. One was his mother, and other, his wife Dila Ahmad. According to Dila, she has lost count of the hardships they faced, save for one incident which is etched in her memory. "At that time, we needed money to tide us over a very difficult period. A collector had told us he was interested in Maamor's work, so we took the bus all the way from Kundang to his home in Shah Alam," said Dila. "But when we arrived at his house, he said he would only pay RM50 for the piece we had brought him. We had never felt so insulted." The painting was not sold but later framed and kept as a reminder of that day. "Today, I wouldn't sell it for RM5,000," said Dila. "Its sentimental value is priceless." Although things are looking up for the artist, with his works sought after by many, life is still not easy. With their teenaged son and daughter in college, tightening their belt is still a daily routine for the couple. They are also saving up for the renovation of their small house in Kundang for Maamor to have a bigger area to work in, and more importantly, to invite his ageing mother to live with him. Since last year, the artist has kept himself busy as a resident artist at the University of Malaya Art Gallery. Although Maamor has exhibited extensively in group shows locally and abroad, his friends have often wondered why he has yet to do a solo. "A solo should mark an artist's mastery of his medium, not merely a showcase of what he has produced. This can only come about once an artist has consolidated all his experiences and skills," he said. Asked when he would be holding his, Maamor, who recently celebrated his 51st birthday, said: "Soon, God willing." Maamor is having a joint exhibition entitled "Faces" at the University of Malaya Art Gallery (UMAG) with artists Dr Wong Seng Tong, Yong Look Lam, and Calvin Chua until Nov 29. The gallery is on Level 5 of the Chancellery Building. Opening hours are 9.30am to 4.30pm; Mondays to Fridays. For details, call 03-7967 3780.